My Hood in 12,000 B.C. We decided to take a trip Memorial Day weekend, so we decided to hit some springs with friends that have never been fresh water diving. We checked into the Cadillac Motel in High Springs Friday night. The accommodations were pretty good, plus you had a full size refrigerator and a microwave in each room. Saturday morning we were at the gates at Ginnie Springs. The girl at the gate told us we shouldn’t dive there because it was mayhem on that weekend with all of the partiers. She recommended we hit Troy Springs. So we turned around and got to Troy Springs. The ranger that worked there gave us a FULL report on every spring in Florida. After cutting him off, we walked down to the water. There were no divers, so we thought it would be great. We geared up and walked the LONG walk down to the spring. On the way down, we noticed a dive class listening to their instructor intently, so we kept our fingers crossed that they wouldn’t be getting in the water any time soon. We started to dive and the water was a little murky from the river, but the viz was ok. After about 5 minutes 10-15 divers jumped in the water and there went the viz! That was one of the worst dives ever. I couldn’t even see my hand in front of my face. I would not recommend Troy to anyone. We headed back to High Springs to regroup and talk about what we wanted to do for the rest of the day. We all decided to go back to Ginnie Springs around 5:00pm. (Thinking the partiers would be talking a nap from the days shenanigans) The people working in the dive shop thought we were nuts for going, but of course, collected our money and off we went. Saying it was chaos is an understatement. Imagine Panama City at Spring Break with Marti Gras included. We were lucky enough to get parking spaces right next to the spring, so we geared up and fought the crowd to get in the water. Once we descended, it was one of the best dives ever! Of course, we were the only divers there, so we felt like we had the whole place to ourselves! Our friends had never been to Ginnie Springs, so they were just amazed with the cavern, clear water and ease of the dive. We then went to the Devil’s Spring System to check that out. Of course it wasn’t as great as Ginnie, but we had fun anyway. Upon leaving the park, we saw body parts we didn’t care to see, young kids running around with half-empty liquor bottles and a kid on a stretcher with a gushing head. (He was hit with a beer bottle). It was nuts! We went there to camp in February and thank God it wasn’t like that when we were there. We would have probably packed up that instant and never came back. The next day we decided to go to Manatee Springs State Park. We decided to hit Catfish Sink. We walked up to it and it was covered in duck weed. Then, air bubbles came up (from other divers) and you could see straight to the bottom! (Around 60 ft.) We practically ran to the truck to get geared up! It was one of the best dives EVER. I would recommend this site to everyone! After we rinsed our gear (there’s a shower right next to the spring) we had lunch and hit Manatee Spring. 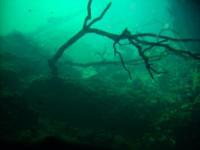 Its only about 25ft deep and relatively small, so we just started looking around. I found a brand new mask (which was returned to a very thankful little boy who lost it) and a new watch. All in all it was a great dive day! Our dive buddies left that night to head home to do some spear fishing the next day. We decided to stay Sunday night and hit Blue Grotto on Monday on the way home. What a surprise that was! I had a absolute blast on those two dives. That is a very cool spot and there was hardly anyone there. We ended up meeting a really nice couple from Georgia there and got them to join divebuddy.com! We were back in Bradenton by 5:00pm and relaxed the rest of the night. We had such a great time! Now I’m ready for the next dive! Gulf of Mexico, here I come!